Abdominal radiography is painless, very safe, and noninvasive, and it can sometimes be performed during an outpatient visit while you wait. Abdominal radiography is useful for evaluating the size, shape, and position of abdominal organs. Sedation is sometimes recommended for patients undergoing radiography. Radiography can help your veterinarian diagnose numerous medical conditions involving the intestines, bladder, and other abdominal organs. Traditional radiography machines use very low doses of radiation delivered in a focused beam (an x-ray) that is aimed at a photographic plate containing specialized photographic film. The patient is positioned between the x-ray beam and the photographic plate. When the x-ray beam passes through the patient, an image is created on the specialized film. Structures that are very thick or dense, such as bone, do not allow much of the beam to penetrate and expose the film. These structures look very bright or white on a radiograph (see the x-ray image). In contrast, structures that are not dense (such as gas in the intestines) allow the beam to penetrate more completely and expose the film. As a result, these structures appear relatively dark when the radiograph is viewed. Structures that are of medium density, such as fluid, appear in various shades of gray on the film. Digital radiograph machines use a very similar principle, but the final image can be much sharper and can show greater detail than images obtained from traditional radiography machines. How Is Abdominal Radiography Performed? Abdominal radiography is painless, safe, and completely noninvasive. Your pet will be positioned on the x-ray table, and the width of the abdomen will be measured. This is necessary for precisely adjusting the intensity of the x-ray beam to capture the most accurate information. Once the measurements are complete, the x-ray tube (which will generate a beam of low-level radiation) is aligned over the abdomen, and a button is pushed on the radiograph machine to take the “photograph.” This part of the procedure is very much like taking a photograph with a camera. In most cases, at least two “pictures” are taken from different angles to create a three-dimensional image of the abdominal organs. Your veterinarian may recommend that your pet receives sedation before undergoing radiography. When an animal is sedated, positioning is much easier because the patient is completely relaxed. Sedation may also be recommended if the patient is in pain. What Are Abdominal Radiographs Used For? Radiographs are used to examine the size, shape, and position of the abdominal organs. The size of organs is important because some medical conditions can cause enlargement of the kidneys, liver, spleen, or other abdominal organs. Some chronic conditions, such as chronic kidney disease or chronic liver disease, can cause these organs to appear smaller than normal on a radiograph. The shape and position of organs can be altered or distorted by certain medical conditions, including intestinal blockages or cancer. Radiography is sometimes used to detect pregnancy and determine the number and position of the fetuses. Tumors, depending on their size and position, can be detected using radiography. Fluid or gas in the abdomen can also be detected through radiography. Conditions such as internal bleeding or intestinal perforation (holes) can cause fluid or gas to collect in the abdomen. Radiography can be used to diagnose many other conditions involving abdominal organs, including bladder stones, kidney stones, and intestinal foreign bodies. What Are the Benefits and Risks of Abdominal Radiography? Radiography has many benefits and very minimal risks. It is very safe, completely painless, and non-invasive. It is available in most veterinary practices and can sometimes be performed during an outpatient visit while you wait. Depending on the type of radiographic study being performed, the procedure may take only a few minutes. The risks of radiography are minimal. Because the level of radiation exposure needed to perform radiography is very low, even pregnant females and very young pets can undergo radiography. If a pet is very unstable, such as a pet with severe breathing difficulties, the stress of performing radiography may be a concern. In these cases, it may be necessary to stabilize the pet (with oxygen or other therapy) before attempting to perform radiography. In the vast majority of cases, the benefits of performing radiography far outweigh the possible risks. Radiography is a valuable tool for your veterinarian because it can provide critical information about many different illnesses and medical conditions. 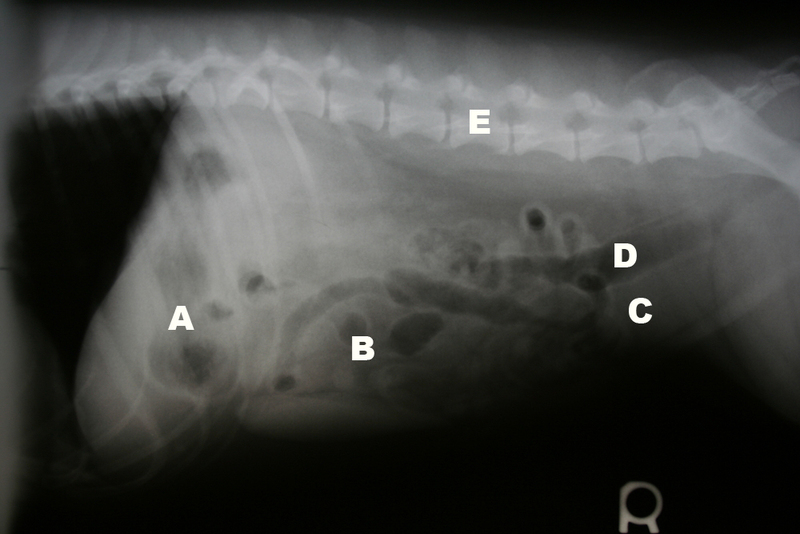 This abdominal radiograph shows several organs that your veterinarian will examine: the stomach (A), intestines (B), bladder (C), and colon (D). Gas in the colon and stomach appears very dark on the radiograph; however, fluid in the bladder is gray, and the bones of the spine (E) appear closer to white.